Specify the main theoretical positions and identify empirical patterns in aspects of human history that need to be explained -e.g. the evolution of cooperation among large groups of people, the persistence of certain types of ritual activity, how improvements in people’s material well-being occur, etc.. 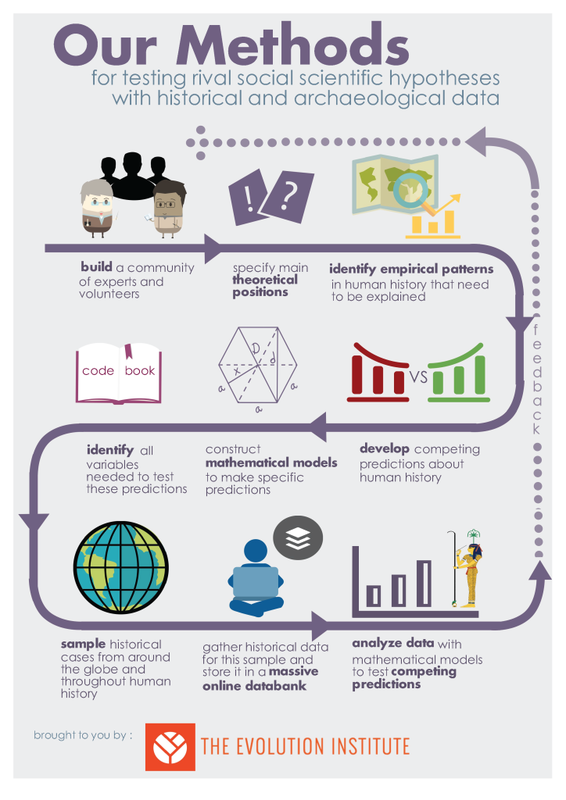 Develop a set of competing hypotheses that make different empirical predictions about human history, including the construction of mathematical models that incorporate historical data. These models will reveal specific features of the predictions that can be tested against each other. Develop a ‘code book’ that identifies all of the information we need to gather in order to test these competing hypotheses. This code book includes historical variables about warfare, inequality, resources, rituals, and much more. Draw a representative sample of polities from around the globe and throughout human history (specifically, the late Neolithic to the early modern period, roughly 4,000 BCE to 1,900 CE). Following the code book, gather historical information from each polity and store this in a massive online Databank. Use the mathematical models from Step 2 to analyse variables in the resulting database. These analyses will determine which hypotheses most parsimoniously explain the empirical patterns.By following these simple steps, we ensure that our results are reliable, generalizable, and repeatable. Most importantly, these methods help us—historians, anthropologists, archaeologists, and anyone interesting in solving these crucial problems—answer important questions about the human experience. For more details regarding our methodology, see our article in Cliodynamics: The Journal of Quantitative History and Cultural Evolution.